Today is day 8 of the bale conditioning process. I've been adding feather meal every other day for the first week, and then every day for the last two. They are damp, and sprouting their residual wheat seeds, and they stink like the feather meal. I installed the t-posts today, and two runs of wire, so we can put the mini greenhouse on once plants are in there. 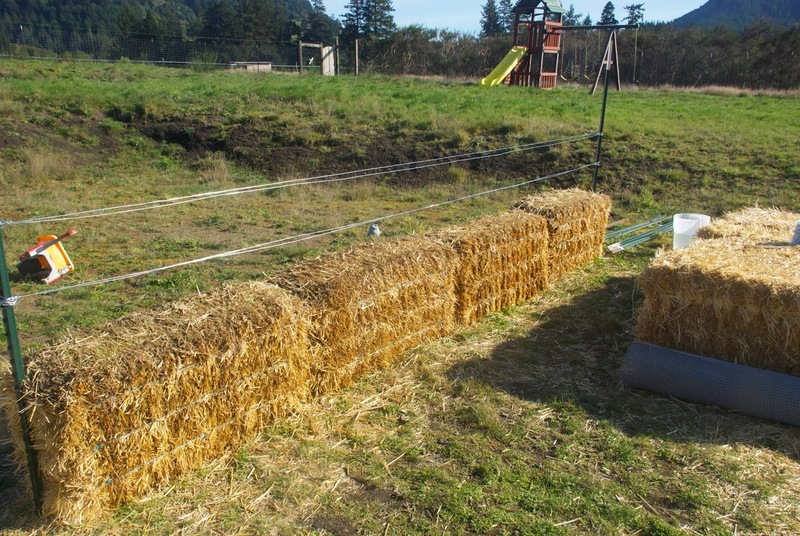 We got a whole new pile of bales for the next round, too, and are deciding where to place them, and in what position. Even though it's going to be temporary, it's still difficult to decide. I want the yard to feel welcoming, and not cramped. I want the kids to have space to play, and yet still have the garden in our midst, AND have the layout naturally help shelter the other beds from the ubiquitous summer wind. In fact, we're having our first wind event today. It's blowing like it's summer out there, reminding me of how much that element affects our every design decision. Drew and I talked yesterday about planting a couple of rows of corn on the terrace above our yard, to help create a windbreak for the garden AND for our own experience of being outdoors. Our wind is so drastic that when it's happening, we can't really enjoy being outside. Anyhow, if all goes well, we should be able to plant seeds into this first row of bales next week. We also planted our tomato, pepper, and eggplant plants. We also are waiting on germination of most of the brassicas, besides the bok choi, which is never worried about anything. Hopefully the broccoli and cauliflower and cabbage and such will catch up.